Dublin, Ohio is synonymous with excellence in education with approximately 80 percent of Dublin residents possessing a bachelor’s or graduate degree. 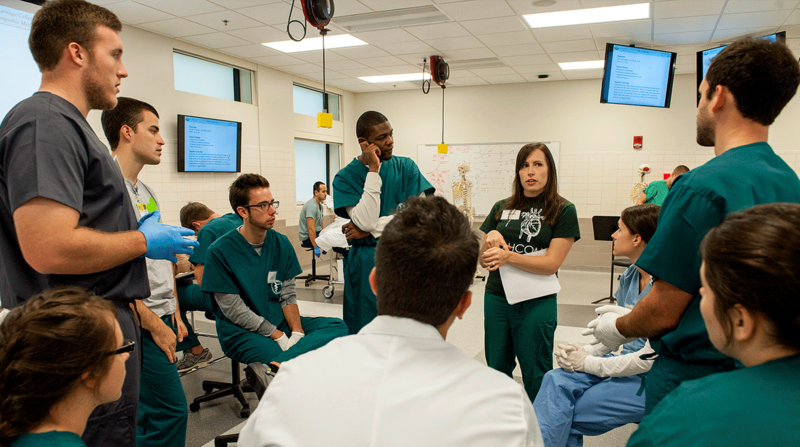 Ohio University Heritage College of Osteopathic Medicine welcomed its first class of 50 medical students on the new Dublin campus in the fall of 2014. The opening of Ohio University Dublin marked the beginning of an exciting legacy for the City of Dublin, the region and the future of health care in Ohio. The College of Health Sciences and Professions (CHSP) is making new connections on Ohio University’s Dublin Center. In April 2015, CHSP opened a new 86,000-square-foot Integrated Education Center on the campus, which houses Ohio University programs from the various schools and facilitates academic partnerships with Columbus State Community College and other Central Ohio colleges, universities and high schools. Programs from the OU College of Business and the George V. Voinovich School for Leadership and Public Affairs will be available in the future. With 64 institutes of higher learning in Central Ohio, including The Ohio State University, the region offers a pipeline to 140,000 college students and 22,000 annual graduates. Franklin University has been recognized by BestColleges.com as one of the Top Military-Friendly Colleges in America. Colleges featured on the Military-Friendly list go above and beyond in their approach to veterans and military families by offering additional services which include financial-aid opportunities beyond the norm, special counseling services, veteran-oriented career consulting and much more. The Dublin City School District offers an exciting and highly enriched educational environment. In addition to being one of the largest and fastest-growing districts in the state, Dublin is also one of the most highly regarded school districts in the nation. All three Dublin high schools have been named to Newsweek’s list of top high schools in the country. Leadership skills and community engagement are the focus; career management, networking, business mentorship are among the topics. In this firefighter-led academy, participants operate the “jaws of life,” use a charged fire hose on a live fire, rappel from our four story training tower and work with EMS training tool SimMan. *The class is open to non-Dublin residents. However, Dublin residents are given preference when the class roster is being selected. All applicants must be 18 years or older.